Physical strength is often characterised by how much you can lift. This is true of Strength Training, the purpose of which is to get stronger, right? Well, that will happen in the first few weeks of any program – you get stronger, fast and are able to lift more weight. In fact in the beginning you can often increase the weights of some lifts by 10-20 lbs, in the first month of training. Then you kinda stall and gains begin to come slowly. At this stage many “fitness instructors say its time to change your program” and give you a whole new set of exercises to do. The process repeats itself and you just trudge along, never really improving. This is the great con of the gym. What happens in those first few weeks is your nervous system becomes more efficient at delivering electronic signals to your muscles to contract. You are able to recruit more muscle fibres, tense your muscles more and then low and behold you are able to lift more – but you haven’t gained more muscle – you’ve just learnt how to use the muscle you have correctly. When the instructor changes the program you then have to start all over again! Teaching your muscles how to contract in a new manner. Just when your body is ready to develop and get stronger, to build new lean muscle tissue – bam, you have to start all over again. What you learn in those first few weeks is Neurological Strength, the ability to contract your muscles harder and therefore become stronger. As such your body is learning its limit, rather than exceeding it and stimulating new muscle growth. This is why I believe it is crucially important that you stick with a program incorporating key lifts such as The Bench Press, Squat and Deadlift and be consistent. These are three lifts taht I often use in my online personal training programs. 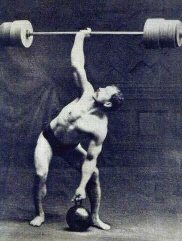 Of course you can add new lifts and techniques to keep from getting bored, but they must never replace and take away from a proficiency in those particular lifts and there variations. If you find that a program designed to give you physical strength and muscle tone or growth is being changed every 4-6 weeks, and you aren’t getting the results you want, Stop. Go back to the basics and consistently use those techniques that stimulate you the most muscle and neurological adaptation. Don’t worry if people tell you “but you need to mix things up to keep shocking your body into new growth and development” – you are, that’s why you increase the weight. That is new stimulus –it’s heavier. When you do this the body becomes very efficient with that exercise and you recruit as many fibres as possible. At this stage when you lift a heavier weight it overloads the muscles causing them to get stronger, tone up, and if you want get bigger.